Since starting this blog 3 years ago I have been very blessed to meet some pretty awesome people including fellow bloggers and models. As influencers we do get the chance to spend time together at events, however rarely does that leave us much time for much of anything else so I was excited when stylist and blogger, Nanthale of N.E.C. Style, getting inspiration from the newly released film, Girls Trip, came up with the idea of a staycation. We decided to take advantage of just a bit of what the city we call home has to offer, creating a weekend itinerary of activities for ourselves and set off to have a great time. 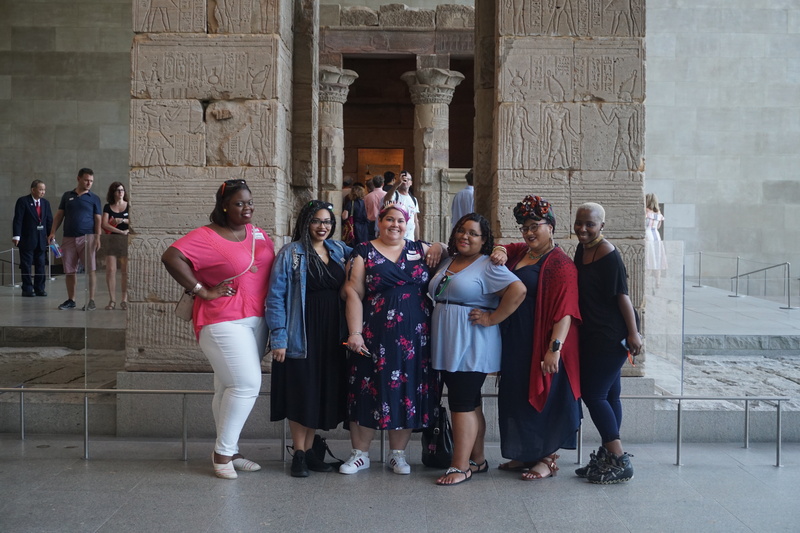 Our group consisted of model and blogger, Brooke of Madame Finehouse, Fabiola of Fabiola Michelle, body positive fashion illustrator, Jonquel of Jonquel Art , Marcy of Fearlessly Just Me and of course, Nanthale. It was a great change of pace to just enjoy each others company for a full weekend even more so since the weekend we chose even fell in line with Marcy’s birthday. Disclaimer: This is a sponsored post; clothes and tour tickets were gifted for feature, but all opinions are my own. Last weekend I got to head over to Lancaster, Pennsylvania with two friends and my mother. A retreat of sorts, it was a trip I wasn’t expecting to go on until my mentor casually mentioned that she had purchased my ticket because I deserved to take some time to unwind. (I truly really am blessed with some great friends.) I had to travel light so I looked to Gwynnie Bee to help me make a decision as to what to pack. Gwynnie Bee is a subscription box service that allows you to try different styles and brands for an affordable rental fee. For my first box I got these two beautiful printed dresses that were just perfect for the occasion especially since they both go well with my favorite crossbody satchel. One we entered Pennsylvania our first stop was Kitchen Kettle Village. 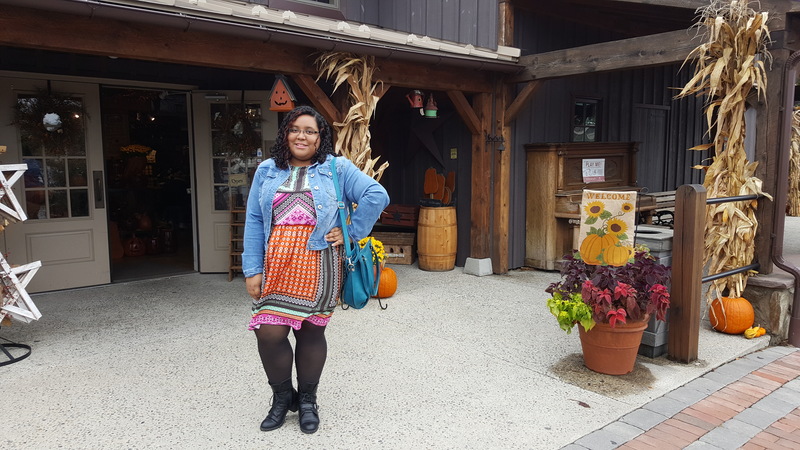 A very picturesque countryside attraction with small shops and restaurants, I got to sample authentic Amish jams, and window shop scented candles, soap, hand-carved signs, handmade quilts, and leather goods. I totally missed my chance to take a buggy ride tour of the nearby Amish farms, but I guess there’s always next time. Ever since high school I developed this habit of avoiding shops that cater more to straight sizes, mostly because I figure since my size and shape is obviously not taken into account in the design of their offered pieces, I would only be wasting my time by looking there. Of course this mode of thinking is false, as evident from this outfit made up entirely of straight size pieces. In addition to this blog, I am actually a design and art history historian as well as a cultural anthropologist. It’s a quite a mouthful I know. Though much of my academic writing and research has taken a back seat since receiving my masters last spring, I have made some efforts in the final months of last year to expand on some projects I had started in graduate school, including my paper on Target, its designer collaboration collections and plus size blogging– a paper I submitted last October to be considered as a possible presentation for the Fashion, Style, Appearance, Consumption and Design area of the 2015 Popular Culture Association and American Culture Association’s National Conference. I was told that once you send in your abstract for consideration it takes approximately a minimum of two weeks to hear back from the area chair, I heard back in two days. From that day I was in crowd-funding and paper editing mode. It was an intensely stressful time given the the other responsibilities I had to deal with such as work, looking for another job, apartment hunting, eventually moving, and starting this blog. It should come to no surprise then that I did my final edits to the paper and accompanying PowerPoint the week before I was set to present. Yet even with all the anxiety fueled by the craziness that is my life, I was very excited to spend Easter weekend in New Orleans for my first (national) conference. 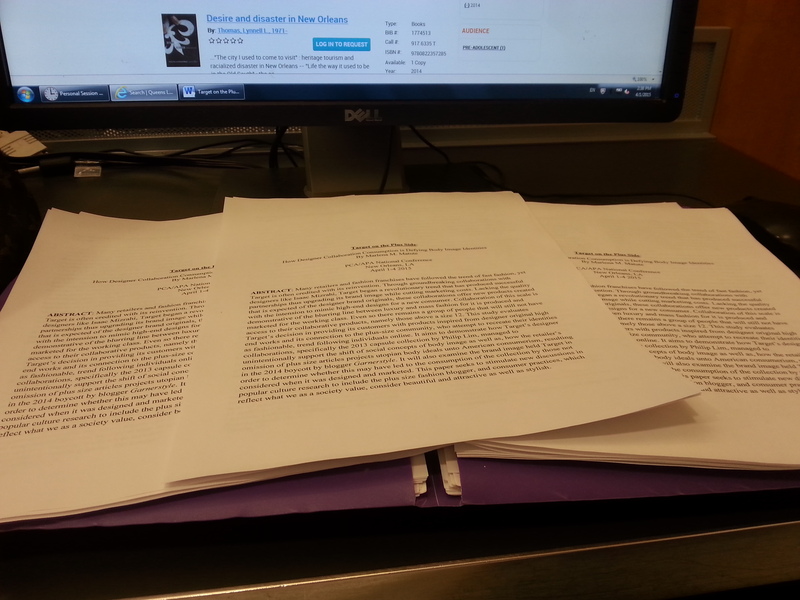 I think my abstract is the longest in history; there was so much to cover in such a little space.